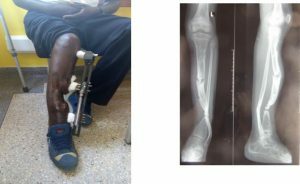 Bunga Raymond, from the DRC, was directed to CORSU by The Missionary Servants of the poor, a Catholic faith based organization based in Lungujja, a Kampala surburb, has helped tremendously in getting him to walk again. Raymond was involved in an accident on the 15th September 2016, suffering an open fracture with loss of a segment of the tibia right leg. He risked losing his leg. Initially treated by the Orthopedic team, but soon it s realized that limb salvage required Ortho-plastic approach. He was planned for distraction osteogenesis, but needed soft tissue cover to cover over the mid-third of his leg to allow for bone transport. Bunga’s is one of several cases increasing collaboration with orthopedics in limb reconstructions.